Capital Area Crime Stoppers (CACS) encourages members of the Austin, TX and Travis County community to assist local law enforcement agencies in the fight against crime by overcoming the two key elements that inhibit community involvement: fear and apathy. Callers remain anonymous and are eligible to receive a cash reward of up to $1,000 if their information leads to an arrest or indictment of a felony offender. CACS provides 3 ways to report information about a fugitive or an unsolved crime: Download the P3 Tips Mobile App today - no remembering text numbers or codes to send a tip! Your identity is secure and you will remain anonymous. Click on "Support Us" button and buy your tickets today! Sunday, April 28th, 1:05. 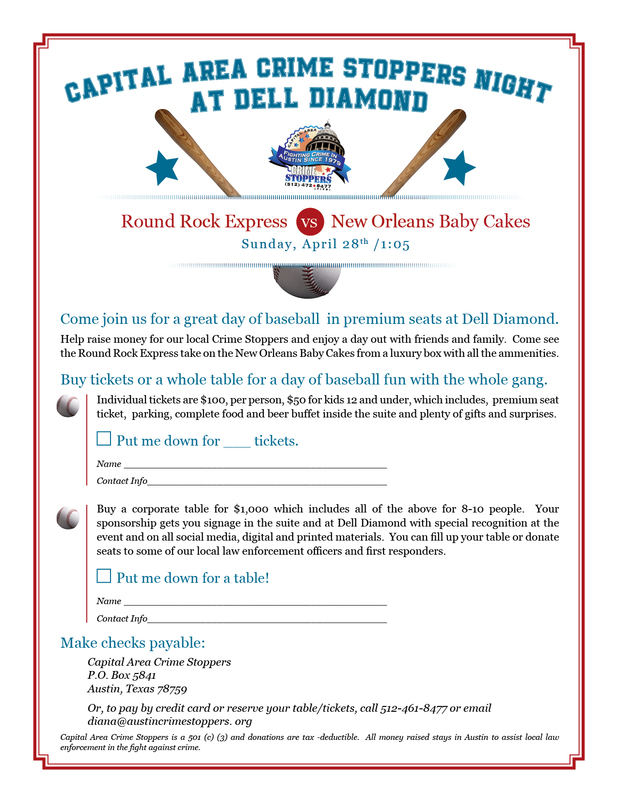 Come join us at Dell Diamond for Crime Stoppers Day and show our community and local law enforcement some appreciation!